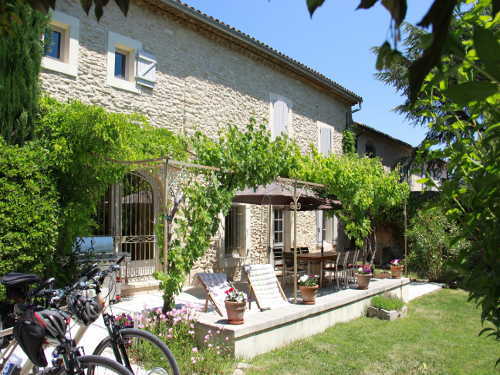 ﻿	Provence Cycling Holidays| Self-Guided Bike Tours| France. 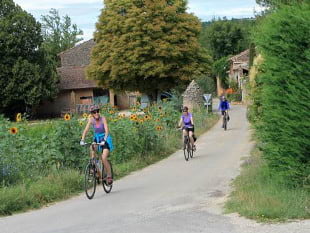 PROVENCE BIKE TOURS - FEATURES AT BOTH THE B&B AND VILLA. Tour the idyllic Luberon Park, famous for its lavender fields and Peter Mayle's "Year in Provence" book. Unique set-up, single base cycling holidays - Relax in 1 of our 2 properties, no packing & unpacking. Small-scale, family-run, flexible Provence bike trips - The right rides for you, at your pace. Self-guided bike tours using the latest Garmin GPS systems for easy, stress-free navigation. Daily personal guidance - Benefit from our local knowledge (we live here all year long). Well-maintained new Trek hybrid bikes & all the equipment you need + bike break-down support. Ebikes and Road bikes available on demand. Bike trip duration: 6 nights / 7 days. 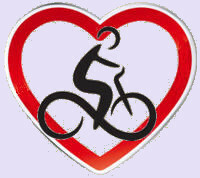 11 years of 5* Provence bike tour reviews on TripAdvisor - CLICK HERE to see them. FROM OUR B&B IN COUSTELLET. B&B BASED BIKE TOUR FEATURES. Enjoy our 17th century Provençal stone farmhouse with pool. 6 Continental breakfasts & 2 home-cooked 3-course dinners with complimentary wine / drinks. From 1 to 8 bikers, with different groups possible. Start days vary, please contact us. A Great Value comprehensive package - Now from €994 to €1,074 p/pers for 6 nights / 7 days. VILLA BASED BIKE TOUR FEATURES. Brand new, 3 bedroom villa from 2016, with pool. Self-catering with fully equipped kitchen with inside & outside dining areas. From 2 to 6 bikers, with only 1 group booking. Now from just €756 to €1,098 p/pers for 6 nights / 7 days. Click here for our 2019 B&B and Villa Provence Bike Tour AVAILABILITIES. Click here for our 2020 B&B and Villa Provence Bike Tour AVAILABILITIES. Click here for a more DETAILED COMPARISON of our B&B v VILLA based bike tours. "We are a family of 6 and stayed at the self-catering villa in Taillades. It was splendid. We loved the set up of the villa - the huge well-equipped kitchen, spacious living areas and comfortable rooms. It fitted our needs to perfection - we had privacy and all the support we needed from Nat & Neil. Our days were spent cycling on one of the many routes programmed on the GPS and Neil would point out the restaurants and highlight sights we should not miss. The bikes were in tip-top condition and it was so helpful that they provided helmets. Nat & Neil were helpful, engaging and wonderful hosts. Villa based bike tour review - Caroline - Singapore - June 2018. "We can't say enough about what a wonderful vacation we had cycling in the beautiful Luberon area of Provence. Neil and Nat and kids are fantastic hosts in their lovely farmhouse complete with fabulous meals and atmosphere. It was great meeting new people from other places. Real family feel, very comfortable. Highly recommended! We hope to be back soon!" "We had a wonderful trip, the bikes were perfect and the GPS navigation took all the worry out of directions. Our hosts Neil and Nat, briefed us every morning on our rides. With the easy GPSs, we were able to enjoy the beauty of the area, stunning views and delightful little villages to explore, including markets, lavender, galleries, churches, and lovely cafes and restaurants to enjoy our lunches. I thoroughly enjoyed my week, a big thank you to Neil, Nat and family." "We stayed at Villa Taillades in June 2017 with a group of friends and had a brilliant time. The villa was beautifully furnished and equipped to a high standard. The garmin route guides took us on quiet tracks and roads that we would never have found ourselves, and were real bonus as there was no map reading required. Neil and Natalene were really helpful with advice on the rides, which restaurants to try and the best places to visit. All in all a fabulous holiday and highly recommended!" Villa based bike tour review - Julia H. - UK - July 2017. 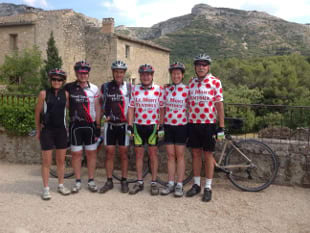 "We're just home from a truly memorable way to experience Provence and our best (four so far) self-guided cycling tour. We honestly couldn't have asked for a better six days. As a small, family-run business, Neil and Nat invite you into their home and lives - you don't get this experience with a large cycling company. We'd love to return and try out their new villa in Taillades." "We would without hesitation return as we feel there is still much to explore on our bikes and Neil and Nat are so welcoming. The Villa is fantastic for those wanting a little more independence and privacy in comparison to the B&B and perfect for a family or a group of friends. Really a first class service. Despite being away from the B&B we still felt we were just a well looked after as if we were staying there. Hopefully when we return our daughter will be able to go in a bike trailer so she can join the fun too." Villa based bike tour review - UK - Sept 2016.